The two prolific celebrities got really close after they worked together on Sisterakas back in 2015, however, they had a falling out afterwards that was allegedly due to conflicting business ideas. Besides the professional strain, Kris Aquino and Vice Ganda’s rift was further exacerbated two years later when the latter teamed up with Kris’s ex-husband, James Yap, to open up a restaurant bar. Another instance of the conflict between the two stars was back in 2017 when Kris declined the offer to appear on a Vice Ganda film, Gandarrapiddo: The Revenger Squad that was part of the 2017 Metro Manila Film Festival (MMFF). Kris reasoned out that she only did that to avoid getting between Vice Ganda and Coco Martin who also had an entry to the 2017 MMFF, but she was well aware that her move disappointed the It’s Showtime host. All these rifts seem to finally meet its end when the Sisterakas co-stars patched things up on Kris’s Instagram Live video last on July 21 where they were seen hugging during a block screening that Vice Ganda arranged for Kris’s new film, I Love You, Hater starring love team Julia Barreto and Joshua Garcia. 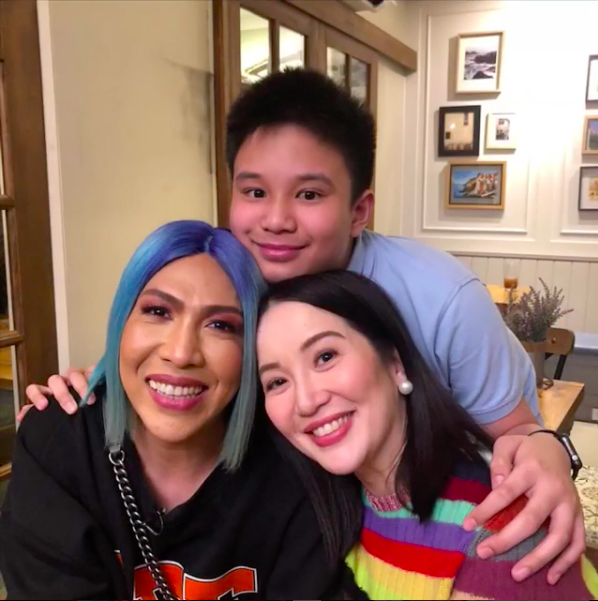 Former TV host, and prominent actress Kris disclosed that she wanted to be friends with Vice Ganda again for her son, Bimby Aquino, who is very fond and love of the popular TV host comedian. In the Instagram Live video on Kris’s account, Bimby was also seen hugging Vice Ganda, the trio sharing a happy moment with Kris Aquino evidently emotional and in tears, wiping it all off every now and then. Social media netizens and staunch supporters on Kris’ Instagram flooded her with love and heart reactions, showing apparent support and warmth towards the recent fixing up between the two celebrities. Through Bimby’s love for Vice Ganda, Kris finally had it in her to patch things up saying that as long as Bimby is happy, then everybody is happy.